Today is Day 3 of our Blog Hop and Giveaway with Lawn Fawn! Are you enjoying what you’ve seen so far? We have more to share from both design teams. Hop along with us and find how to enter to win our giveaways at the end of the post. Hello friends! Vicki here to share a fun project I created with Adhesive Sheets and these adorable Critters at the Dog Park Stamps and its matching dies. I decided to use Perfectly Plaid Rainbow papers to stamp on because of its bright happy colors and patterns – perfect for my project. We have two very spoiled pooches. They get their share of treats, so I decided to make a fun treat jar for the counter. Apply the Adhesive Sheets on the back of the stamped paper before die-cutting which covers your die cuts from edge to edge in a breeze! Simply peel off the back and it ready for placement. It’s great for my curved glass surface! There are so many cute pups in this set, I had to show you the ones on the back side too. To finish off the Treat Jar with some trim and ribbons, Crafty Power Tape to holds them in place. Now I’ll have a cute jar for my counter and the pooches will certainly be happy too. Come find me at my blog, This Art that Makes Me Happy. I fell in love with this Shut the Front Door die, what a great idea, and perfect for so many ocassions! The door opens if you want it to, but I adhered it shut for this card. First I die cut the door twice, so I could fussy cut the panels. Edges were inked to give a little more definition, then adhered with Thin 3D Foam Squares. These are 1mm in height and give a little lift where you want it. Next, I used Crafty Foam Tape behind the door, it’s on a roll and easy to cut the lengths I need. For the potted cactus I doubled up 3D Foam Squares, so they actually sit higher than the door. Subtle shades of yellow with yellow ink mimic the colors in the desert. Here in this photo you can see the different levels of each element and the fun you can have with 3D Foam Products! Lawn Fawn Blog Hop and Giveaway – Day 3! If you cannot see the comment section (at the bottom of this post), please click: Lawn Fawn Blog Hop and Giveaway – Day 3 and scroll down to the bottom of the post. This entry was posted in 3D Foam Squares, 3D Projects, Adhesive Sheets, Adhesives, Announcement, Cards, Crafts & Tutorials, Crafty Foam Tape, Creative Photo Corners, E-Z Runner® Dispensers, E-Z Runner® Grand, Gifts, Home Decor, Permanent Adhesive, Tutorial and tagged 3D Foam Squares Mix White, Adhesive Sheets 12x12" (5 sheets), Adhesive Sheets 4x6", Adhesive Sheets 6x12", Beth Pingry, Blog Hop, Crafty Foam Tape White, Crafty Power Tape 20' Dispenser, Crafty Power Tape 20' Refill, Crafty Power Tape 81' Dispenser, Creative Photo Corners Kraft, E-Z Runner Grand Dispenser, Giveaway, HH Double-Sided Tape Runner Permanent Strips 150ft, Lawn Fawn, Pets, Thin 3D Foam Squares White, Treat Jar, Vicki Chrisman. Bookmark the permalink. 74 Responses to "Lawn Fawn Blog Hop and Giveaway – Day 3"
Love the dog treat jar. How amazing is that dog treat jar. I think I have to do something like that for my cookies. I love the door card! I am in awe of how real the doorknob/handle looks! How did you do that? Please share! Thanks!! I don’t even have a dog…and I LOVE THE TREAT jar. This may be a gift idea for my Sister. Thanks for sharing! The dog treat jar is so cute. Such a cleaver use of the adhesive sheets. Cute projects and like the use of adhesive sheets to die cut. Love the Shut the Door card and that you can have the door open to reveal a message if you want it to. The doggy treat jar is adorable! What a beautiful creation!! Love it! How cute is the dogie treat jar. Need to try this we just leave ours in the box! and the front door card is adorable! I love the treat jar! Love the treat jar! What a cute idea. Awww!!! Adorable projects!!! Love the jar!!! What a happy treat jar! So fun! Love the jar. Such a fun way to use these cute stamps and dies. Thanks for the inspiration. Awesome projects! I love the treat jar with those adorable print paper pups! Sweet! And I love the 3D Foam products to give the door the extra dimension! Darling card! I just got the door die and I will have to get some of the Thin 3D Foam Squares… have not tried those yet! I have absolutely got to make this puppy treat jar for a Christmas gift! It’s going to be perfect!!! Thanks for the idea! Amazing projects, I am so going to dress up that treat jar for my dog! What awesome ideas! I need to try out the door card! Love the treat jar What a great idea. I like the cute papers and trims on the treat jar and the dimension on the cactus card. A fun jar! Such a beautiful card! Fabulous project ideas! The details on the jar are so adorable and I love the texture of the brick on the card. I really need to scrap lift the dog treat jar. my treat dog for our Stormy is just wore out! It is a super idea and adorable! The door card is just darling! Love the use of the 3d foam squares! Wonderful idea! Looks wonderful! Great job ladies! What a great treat jar! OMG, these projects are TOO cute. 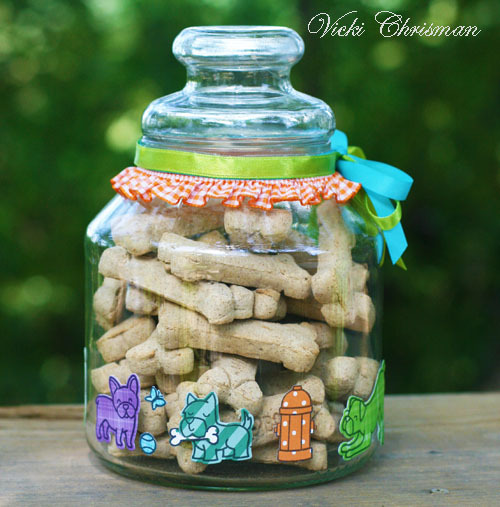 I love seeing other ways of using stamps and dies, and the Dog Treat Jar is adorable! The treat jar is adorable. Great gift idea for dog lovers. The dog treat container is wonderful! I love the Lawn Fawn doors with cactus on each side. The pop outs at different thicknesses make it adorable. I love the projects today!!! Especially that adorable treat jar! Great inspiration, thank you! What a cute treats jar!! I love the door card! That die set is on my wishlist. Somme fabulous inspiration!! These are great creations ! I love the dog treat jar ! I love both of these ideas!!! Like the dog treat creation. My dog Daisy would like this. Like the cactus card for the Western feel. Such cute details in both projects! Love what can be done on a jar! And the Southwestern look of the door is fabulous! All of the levels created with the foam tape are so cool! Excellent card! Love the dog treat jar. I need to make one of these. I absolutely LOVE the dog treat jar. Brilliant! Darling Door card. So unique with the cactus!! I think my dog, Toby, wants a dog treat jar like that one! Loving the cute paper pieced images. 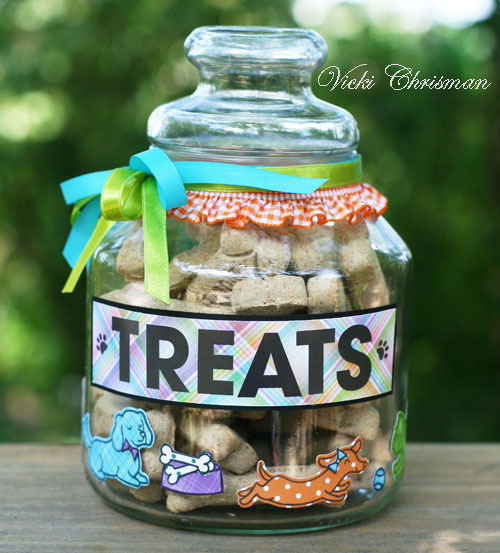 What a sweet way to decorate a dog treat jar, or even a treat jar for people!! I can think of so many different ways to pretty them up with ribbon and stamps. 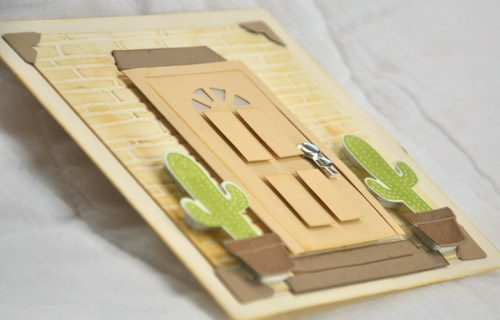 Your decorated front door card is so classy and elegant and the cacti keep it whimsical! I don’t even have a pet but I think that dog jar is to stinkin cute! I love your sticky sheets but really anything to hold my cards together with your kind of strength ! Thanks for the opportunity to win! More great projects! The door card is fantastic! I love how you used the brad for the doorknob. The dog treat jar is adorable but I live the card as well. Great job! How cute is this jar!! !Love it! LOVE today’s project…especially the doggie jar!!! Wonderful dies and adhesives! Thanks for sharing! Too too cute. Those critters are just adorable. The colouring is lovely. When you came out with Adhesive sheets I could have cried. I will have to make a treat jar for my dog now. Beth Pingry’s Door Card is great!!!! Wonderful ideas! Love the treat jar! That card is so cool. I love the dimentionality of it. Love the little do images on the jar, so cute. I could really use a few of those door cards as house warming cards:) Thank you! OH MY goodness…. What a fabulous idea!! Doggie treat jar!! I absolutely adore it and your cards are o stinkin’ pretty!!! Fun creations! That dog treat jar is so sweet, and I love the door card.